Article 1. The Empire of Japan shall be reigned over andgoverned by a line of Emperors unbroken for ages eternal. Article 2. The Imperial Throne shall be succeeded to byImperial male descendants, according to the provisions of theImperial House Law. Article 3. The Emperor is sacred and inviolable. Article 5. The Emperor exercises the legislative power withthe consent of the Imperial Diet. Article 6. The Emperor gives sanction to laws, and ordersthem to be promulgated and executed. Article 7. The Emperor convokes the Imperial Diet, opens, closes, and prorogues it, and dissolves the House of Representatives. Article 8. The Emperor, in consequence of an urgent necessity to maintain public safety or to avert public calamities, issues, when the Imperial Diet is not sitting, Imperial ordinances in the place of law. (2) Such Imperial Ordinances are to be laid before the Imperial Diet at its next session, and when the Diet does not approve the said Ordinances, the Government shall declare them to be invalid for the future. Article 9. The Emperor issues or causes to be issued, the Ordinances necessary for the carrying out of the laws, or for the maintenance of the public peace and order, and for the promotion of the welfare of the subjects. But no Ordinance shall in any way alter any of the existing laws. Article 10. The Emperor determines the organization of the different branches of the administration, and salaries of all civil and military officers, and appoints and dismisses the same. Exceptions especially provided for in the present Constitution or in other laws, shall be in accordance with the respective provisions (bearing thereon). Article 11. The Emperor has the supreme command of the Armyand Navy. Article 12. The Emperor determines the organization andpeace standing of the Army and Navy. Article 13. The Emperor declares war, makes peace, andconcludes treaties. Article 14. The Emperor declares a state of siege. (2) The conditions and effects of a state of siege shall bedetermined by law. Article 15. The Emperor confers titles of nobility, rank,orders and other marks of honor. Article 16. The Emperor orders amnesty, pardon, commutationof punishments and rehabilitation. Article 17. A Regency shall be instituted in conformity withthe provisions of the Imperial House Law. (2) The Regent shall exercise the powers appertaining to theEmperor in His name. Article 18. 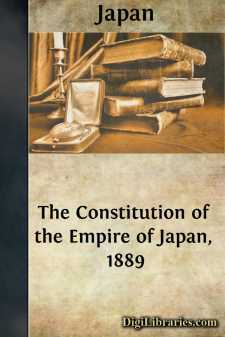 The conditions necessary for being a Japanese subject shall be determined by law.